Miele canister vacuum cleaners are instantly identifiable by their unique design and stylish character. Careful attention is paid to every curve, angle and line ensuring that the only thing rivaling the vacuum’s beauty is its functionality. Skillfully crafted to provide easy operation, effortless movement and remarkable efficiency – Miele’s beauty is far more than skin deep. The Germany family-owned manufacturer was founded in 1899 and began producing vacuum cleaners since 1927. The company’s philosophy of continuous improvement has made them a favorite throughout the world. Their products don’t have bargain prices, but provide value in high quality design and manufacturing that result in superior performance and durability. Having long time in the industry prove that Miele is another great vacuum cleaner manufacturer that really take care of what consumers needs. Please note that most of the Miele canister vacuum has average life-span of 20-year. The following are recommendation of Miele S2 series canister vacuums. Please note that all the models recommended below are getting high rating and proven to be effective in cleaning. There are four models in this S2 series. As of today, this series is consider as an entry-level as it’s the cheapest series compare to the rest of the canister vacuums by Miele. All the models are made with quality assurance and hence it’s very popular in the market with high score ratings. This is one of the best seller products in the Amazon canister vacuum category. 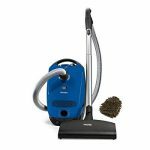 The great features and high ratings or reviews by the existing customers reassure that this is a reliable and affordable vacuum. You can expect the following features from this vacuum cleaner. 6 different speeds control (via rotary dial selector) allowing perfect suction for different types of rugs and floors. It equipped with safety shut-off feature to prevent overheating. The stainless steel telescopic wand delivers a superior operating radius of 29.5 ft for easy above floor cleaning. It has long power cord has a great auto-rewind feature to save time and energy. The auto-seal FilterBag instantly locks in dirt, dust and allergens when the bag is remove from the machine for emptying. It has combination floor tool allows effortlessly transition from smooth floors to carpeted surfaces with a quick click of the rocker switch. 7-year suction motor & casing & 1-year all non-wearing components warranty. The Miele S2121 Olympus canister vacuum is older model now. Get the Miele Classic C1 Olympus model. This is a lightweight and powerful (1200 watt motor) cleaner is exactly similar like Miele Classic C1 Olympus model. The only different is that it comes with the STB 205-3 Turbobrush which is activated by the suction of the machine and its rotating roller brush loosens the dirt and sweeps up fluff and hair! Note: Miele has older model of Classic C1 Capri canister vacuum called Miele S2121 Capri canister vacuum. Both of the vacuums are almost same, to find out more about the Classic C1 Capri, read full review here. Deluxe Handle with Electrobrush Controls – Ergonomic grip with convenient on/off power switch. Miele SEB 217-3 Electro Comfort Electrobrush – Electrically-driven carpet tool with 10″ wide brush roll and swivel neck design for easy maneuverability on low to medium pile carpeting, rugs and smooth flooring. To know more about this cleaner, read the customer reviews and check the latest price of it, visit here. To read the full review on Miele Classic C1 Delphi vacuum cleaner, click here. It uses Miele Hyclean dust bag and HEPA Filter which is good for any allergy or asthma sufferer. It comes with Miele parquet floor brush and Miele SEB 217-3 Powerhead which is perfect for low pile carpeting and (bare floors when turned off the Powerhead). It has six different levels of suction controls allowing perfect suction for drape, rugs, bare floors, etc. Multiple electronic suction dial settings is available including drapes, furniture, throw-rugs, quiet setting, large area rugs and wall to wall carpet/bare floors. Uses extra-large Miele’s G/N vacuum cleaner bag which is a self-sealing 9-layer bag that fills up tight and is resistant to breakage from nails, glass or screws! It comes with a crush-proof ergonomic hose that has vario-clip which stores the included crevice tool, upholstery tool and dusting brush on the machine. The quick-disconnect feature on the wands and hose means there are no wires outside the wands, everything is integrated and easy to connect. 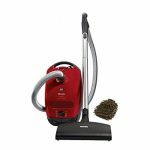 To get this Miele Classic C1 Titan canister vacuum with great saving and free shipping, visit here. Full review is available here. Miele is a famous brand i trusted and Miele S2121 Olympus Canister Vacuum Cleaner i recommeded for customers to use. It makes me happy for cleaning.